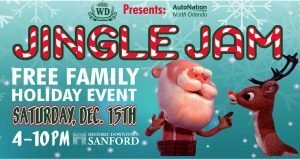 Wayne Densch Inc. Presents – JINGLE JAM 2018 in Historic Downtown Sanford FL on December 15th from 4-10pm. Come Celebrate the holidays with us at this FREE to the Public Holiday Event covering several streets in Historic Downtown Sanford (The Famous L – Celery City to West End and up Sanford Ave)! Festivities include LIVE MUSIC on 3 Stages, Holiday Vendors, Carnival Games, A Magic Show, Pictures with Santa, 15+ Gourmet Food Trucks, LIVE Wrestling Acts & much more! This is a Family and Pet-friendly event!